The Sisters of Saint Joseph have been involved in Aged Care ever since Mary MacKillop and Julian Woods opened a House of Providence in Adelaide in 1868. There they provided shelter for homeless or destitute women and children, with a special focus on the elderly from the back streets of Adelaide. This was a brave venture. 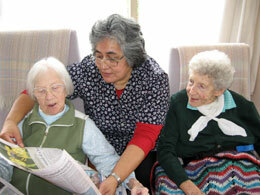 The Sisters, who had no fixed income, trusted in God for what they needed. They begged for aid from local people, who seldom refused them because they knew of the Sisters’ care for the destitute poor. This work was very important to Mary MacKillop who set up a House of Providence in Sydney as soon as possible after the Sisters’ arrival there. The health and wellbeing of her Sisters was also important to Mary, who set up convent infirmaries where sick and dying Sisters were cared for, especially during their final illness. Many changes have occurred over the years but the Sisters are still responsible for Josephite Aged Care facilities in South Australia, Victoria and New Zealand. Wherever they are, Sisters involved in this work carry on in the spirit of their founders, always keeping in mind the dignity of each person. They are particularly concerned about the well-being of those who are poor and isolated in their local areas. They also offer support to families, local communities and staff members in their challenging roles as carers. As circumstances and government regulations have changed, convent infirmaries have been forced to close and so the Sisters are cared for alongside the other residents in their own or other aged care facilities wherever they are.